The black Selador Desire D60 Lustr+ LED Fixture with Stage Pin Connector from ETC combines 60 Luxeon Rebel LED emitters in one unit, to provide powerful, high-intensity light output. This round, PAR-shaped washlight is well-suited for stage, studio and anywhere brightness and color flexibility are required. 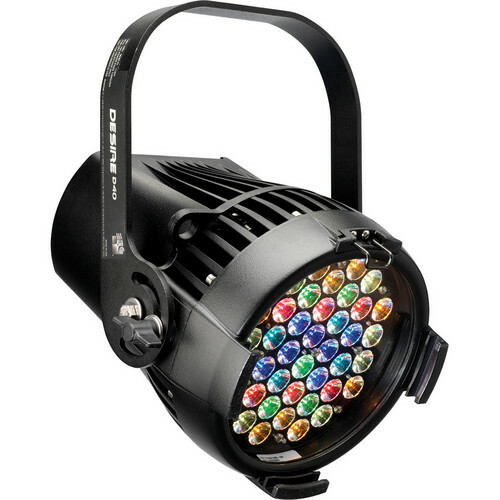 It comes with the Lustr+ color array that uses the premise of the x7 Color System to create lush white and subtly tinted light that can be adjusted to naturally illuminate on-stage talent or scenery. The x7 luminaires blend up to 7 LED hues to provide a nearly unlimited number of color mixes. You get additional options from the Adaptive Control System built into the luminaire. You select the DMX profile such as Calibrated HSI, Calibrated RGB, Calibrated HSIC, Studio, or Direct, and your luminaire adapts its color and functionality to each application. You have additional control with the Plus 7 setting, which allows you to tweak each LED color individually, and the fixture’s Red Shift function imitates the fade of a tungsten source. The luminaire features a user interface with Quick Setup options to simplify work. You can choose from Stage, High-Impact, XT (Exterior)/Architectural, General and Studio settings to customize the luminaire to your specific task. You can further tailor the fixture to your needs by choosing profile and performance settings via the user interface. The luminaire can be controlled from a DMX-enabled controller, like an ETC lighting control console, or can be run on its own by selecting the Stand Alone Mode on the unit. 60 Luxeon Rebel LED emitters provide high intensity light. The x7 Color System blends up to seven LED hues to provide a nearly unlimited number of color mixes. A Duv rating of 0.000 indicates that the color mix used is exactly on the black body line, with no green or magenta tint. Box Dimensions (LxWxH) 21.5 x 15.0 x 12.5"